The White House says it will reduce greenhouse gas emissions in the federal fleet by 30% by 2025 as it ramps up purchases of zero emission and plug-in hybrid vehicles. 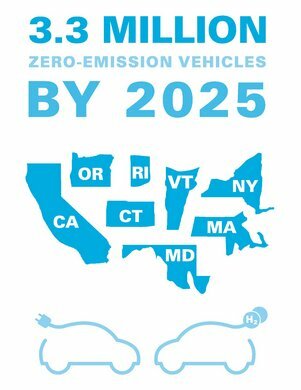 By 2020, zero emission (battery electric and hydrogen fuel cell) or plug-in hybrid electric vehicles will make up at least 20% of new vehicle purchases, and that will go up to 50% by 2025. 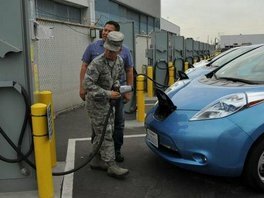 Federal agencies have also been directed to make sure adequate charging becomes available for these fleet vehicles. It’s part of a broader effort by the federal government to cut greenhouse gas emissions 40% by 2025 over 2008 levels and save $18 billion in energy costs. Tesla Motors has been given the greenlight in New Jersey to sell its electric cars at non-dealership corporate stores. A bill signed by Governor Chris Christie will once again allow Tesla to directly sell its electric cars in the state through its retail locations. A year ago, the governor enacted a rule that blocked Tesla from selling cars this way, only allowing for franchised dealers to sell new cars in the state. Tesla can no go back to operating up to four retail locations in the state and one service center. It’s cheaper to pay for a two-year lease now – $199 per month versus the previous $259 for the Honda Fit EV. Customers can extend their lease with unlimited mileage, routine maintenance, and collision coverage if they prefer; new customers can get the same deal on used Fit EV. The Fit EV is powered by a 20-kWh lithium-ion battery and a 92-kilowatt electric motor. Medium duty plug-in hybrids are popular with fleets – as was discussed during an ACT Expo webinar last week, “Electrify Your Fleet.” Matt Jarmuz, director of sales at Odyne Systems, is seeing fleets save up to 50% or more on fuels switching over to plug-in hybrids, and some are utilizing EPAct credits. Ned Biehl, chief of staff for the Transportation Services & Aviation department at PG&E, says that his fleet is being agnostic to suppliers but sound in their business strategy in choosing the best technology. The fleet has a broad mix of electric, hybrid, natural gas, propane, and biodiesel-powered vehicles. BMW Group CEO Norbert Reithofer sees the obvious: political initiatives in a number of the carmaker’s key markets are important in helping to boost sales of its i3 electric compact car. Norway is a good example of it for Reithofer, where the government offers a well-established charging structure with free parking and charging and where there are no sales or registration taxes on electric vehicles (EVs); that helped BMW sell 2,000 i3s last year in that country, almost one quarter of its total sales in Norway. Half of its US i3 sales were in California with its rebate for buying an EV and its dedicated carpool lane stickers. EV buyers in Shanghai get to avoid the restrictive and expensive vehicle licensing process; in Europe, the UK and France offer EV buyers financial incentives and Germany exempts EVs from its annual vehicle tax for 10 years. BMW disputed media reports saying its third EV model after the i3 and i8 would be a variant of the X5 premium large SUV. Last year, BMW’s global sales of the i3 and the i8 were a combined 17,800 units. Automakers are covering their bets when it comes to meeting strict standards in global markets for reducing greenhouse gas emissions and dealing with fluctuating fuel prices. Navigant Research predicts that gasoline-engine vehicles will still be dominant in new vehicle sales and will meet demand from car buyers who aren’t yet ready for electric vehicles. The research consultancy predicts 59% of light-duty vehicles purchased in 2025 will feature turbochargers. Other changes include implementing more lightweight materials in the vehicles, using smaller engines, stop-start technology, cylinder deactivation, direct injection, and transmissions with eight or more speed ratios and high-efficiency internal components. Tesla Motors doesn’t have a radical new technology rolling out to deal with range anxiety – that worry will be addressed through a software upgrade, according to Tesla CEO Elon Musk. Over-the-air software updates to its Model S sedan will deliver Version 6.2 with two new features — Range Assurance and Trip Planner. One will automatically plan charging stops using the navigation system and the other will warn a driver if a road trip is likely to leave them stranded. These are being tested now with drivers and will be sent out to cars in about a week. Beaming software upgrades will also move the Model S forward on its Autopilot semi-autonomous features. Version 7.0 will arrive this summer. New features haven’t been revealed yet, but it will add to current Autopilot offerings such as the ability to automatically change lanes by flicking on the turn-signal lever. Ford Motor Co. continues to add to its sustainability roster – its environmentally responsible, high-performance REPREVE fiber that comes originally from plastics dumped into landfills will be available in the all-new F-150 pickup truck. Using the recycled material in the F-150 will allow Ford top divert more than five million plastic bottles from landfills this year. At the Geneva Motor Show, Mercedes-Benz announced that it will add 10 new plug-in hybrid electric vehicles (PHEV) to its lineup by 2017. That means a new PHEV will be rolled out about every four months. The first one was launched last year in the S500 Plug-In Hybrid, and this month, the new Mercedes C350e will roll out. To comply with stringent emissions and fuel economy standards while nearly doubling its global sales by 2018, Jeep may roll out a new pickup along with the brand’s first plug-in hybrid electric vehicle. Jeep CEO Mike Manley talked about it during a preview of seven concept SUVs Jeep will take out onto the trails during its annual Easter Safari in Moab, Utah. Extra: a teaser for Green Auto Market Extended Edition. This week: The Formula E race series appears to be taking electric vehicle technology to a new level, gaining passionate support from Virgin Group founder Richard Branson and the family dynasty of racing legend Mario Andretti. Several people are very excited about that racing event coming to Long Beach, Calif., next month. BYD taking on batteries: Chinese automaker BYD Co. is taking an active role in the global automotive and energy markets. The company, backed by Warren Buffett’s Berkshire Hathaway Inc., will be adding 18 gigawatt hours of global production for batteries over the next three years, putting it on par with Tesla Motor’s $5 billion “gigafactory” for electric vehicle battery manufacturing and energy storage capacity. Most that battery production is in China, but the company is opening a large factory in Brazil this year and will scale up production in the US. In 2013, BYD opened two manufacturing plants in Southern California for producing electric buses and batteries. On Friday, ridesharing giant Uber announced that it will be working with BYD on testing a fleet of electric cars for Uber drivers. This is the first time Uber will try out electric cars (which has been a popular fleet offering with carsharing companies Car2Go and Zipcar). The test program was kicked off a few weeks ago in Chicago and may be expanded to other cities. DOE projects awarded: An interesting medley of universities, coalitions, and associations have just been granted about $6 million for 11 projects supporting advancement of clean transportation by the US Department of Energy (DOE). Some of the projects will help consumers and fleets adopt alternative fuel vehicles and infrastructure to help spread education and support for these projects. For example, a state agency in Florida is leading the Drive Electric Orlando project and received $400,000 to increase consumer familiarity and support for plug-in electric vehicle adoption. Forgetting to shut down your Volt: A recall has been issued on about 64,000 Chevrolet Volts in model years 2011, 2012, and 2013; the problem stems from drivers mistakenly leaving the car running (which does happen on cars with keyless fobs running partially or completely on battery power). That means hazardous carbon-monoxide could spread in that area, which can be quite toxic in a garage. General Motors has issued the recall and notified the National Highway Traffic Safety Administration (NHTSA) about it. Goodyear and green tires: Goodyear rolled out two green concept tires during the Geneva Motor Show. The first one sounds similar to what Protean Electric offers – its BHO3 can provide an additional source of electricity for electric vehicles – similar to energy coming from regenerative braking and power produced by Protean’s in-wheel electric-drive system. Goodyear’s BHO3 can harness heat created during normal driving conditions for producing electricity. The second concept from Goodyear, the Triple Tube, offers a pump that can adjust the tire into three different configurations; one of them, “Eco-Safety,” inflates the tire decrease rolling resistance. Tesla relieving range anxiety: Tesla Motors CEO Elon Musk tweeted on Sunday that the automaker will announce a software update on Thursday that will “end range anxiety” and satisfy driver concerns about running out of battery power. In other Tesla news, the electric carmaker will be moving executive positions around to deal with its growth in deliveries in Asia, North America, and Europe. Jerome Guillen, vice president of global sales and service, will change over to a customer satisfaction role. Tesla will hire regional executives to better manage challenges like gaining sales traction in China. Porsche may be making an electric car: Porsche may enter the luxury battery powered sports car world to take on Tesla Motors – and long-term competitor Ferrari SpA. Porsche AG chief Matthias Mueller acknowledged Tesla’s practical approach during a press conference on Friday. Porsche will be rolling out is seventh model line by 2020 but has yet to decide on the details. It will be a sports car model that would go directly after Ferrari. Autocycles being adopted: Twenty six states now have laws in place, or are developing them, allowing three-wheeled, enclosed vehicles that are usually called autocycles to go street legal. Sen. David Vitter (R-La.) has introduced legislation that would bring the autocycle classification to the federal level. One of these companies, Elio Motors, has been gaining a lot of interest in the past year for its three-wheeler electric autocycle available for $6,800. Intrigue continues on Apple: Is Apple Inc. entering the electric vehicle (EV) market? Investor shareholders have expressed interest in the technology giant creating a joint venture with Tesla Motors to build the most cutting edge EV ever, according to Apple CEO Tim Cook. “Quite frankly, I’d like to see you guys buy Tesla,” an investor told Cook recently, who sloughed it off. In other news, Apple asked a US court to dismiss a civil lawsuit filed by battery maker A123 Systems over engineers hired by Apple. Apple says it’s too speculative to proceed and has avoided giving out details on whether or not it will be starting up an EV manufacturing or lithium battery division. Billions in advanced vehicle R&D: Automotive News just released an in-depth analysis piece on the massive challenges global automakers are facing in new technologies. 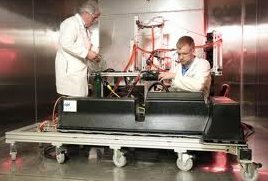 Long gone are the days of slowly testing and developing new vehicle powertrains. The US 54.5 fleetwide fuel economy standard and tightening emission rules in Europe are driving much of the changing landscape; as are innovations in electric vehicle and hybrid systems – and companies like Google, Tesla, Apple, Uber, and Zipcar changing the rules of the game. That means billions in investments and a higher level of risk – with one example coming from Volkswagen, which will spend $7 billion in North America over the next five years on new plants, models and technology, and a new engineering center. Valeo making investments: French automotive supplier company Valeo is looking at acquisitions that could leverage its role in fuel efficiency and autonomous vehicles. 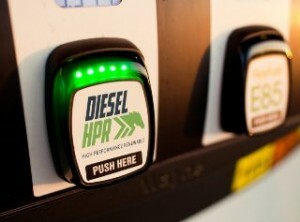 Hybrid technologies is one route the company is traveling to help automakers cut fuel consumption and carbon emissions. Another strategy is through connected, self-driving cars. Valeo announced a deal with Mobileye on March 11 to use the technology company’s image processors in autonomous and collision-avoidance applications. Green Auto Market is changing its format this week, adding another weekly publication that goes out on Mondays – Green Auto Market Extended Edition. The former monthly subscription publication is going weekly, featuring a commentary and at least one market data analysis section (with this week focused on hybrid and electric vehicle sales). Green Auto Market will continue to be a free weekly newsletter sent out on Tuesdays, but will be a brief newsletter with more in-depth coverage and analysis presented in Extended Edition. This week’s Extended Edition presented readers with “Test driving a Model S P85D while experiencing what’s unique about Tesla Motors’ marketing tactics” – If you’re interested in driving a Tesla Model S – especially if you really want to try out the “Insane Mode” and go from zero to 60 mph in 3.2 seconds – then you’ll need to schedule an appointment at a nearby Tesla store. Tesla will not be participating at a ride and drive during an upcoming auto show or industry conference. Just like its Supercharger fast charger stations, Tesla Motors does everything its own way – and keeps things very interesting. Here’s what it’s like to visit a store and take the Model S P85D for a road trip. Other features for this month include hybrid and plug-in electric vehicle sales charts and market trend analysis. In the next few weeks, a stock market chart will be featured on major clean transportation companies and suppliers; fuel prices; charging and alternative fueling infrastructure; and other important data metrics on what’s next for advanced vehicle technologies and alternative fuels. Green Auto Market Extended Edition is available for $75 per year; subscribers can register on this PayPal page. Comp subscriptions are available for media and industry associations; contact Editor Jon LeSage for that request. 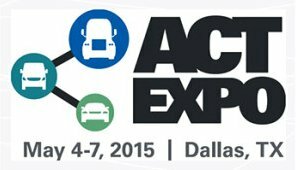 Keynote speakers announced for ACT Expo: Gladstein, Neadross and Associates, organizers of the Alternative Clean Transportation (ACT) Expo, announced the speaker lineup for the 2015 conference to be held May 4-7 in Dallas. Keynote presentations will be made by Gregg Rogen, SVP, productivity and sustainability, Frito-Lay; and David Steiner, president and CEO, Waste Management. Frito-Lay in its fleet has nearly 300 electric trucks, more than 200 CNG-powered trucks, more than 650 hybrids, and a growing number of propane autogas and biodiesel vehicles. Waste Management operates the largest fleet of heavy-duty trucks in North America, and Steiner will talk about the company’s investment in alternative fuels and infrastructure. Other speakers during the conference include Boone Pickens, founder, chairman and CEO, BP Capital; Mike Whitlatch, vice president, global energy and procurement, UPS; Elizabeth Fretheim, director of logistics sustainability, Walmart; and Drew Cullen, senior vice president of fuels and facilities services, Penske Truck Leasing. View the event’s full agenda here. February plug-in sales. The Nissan Leaf took a narrow lead over the Tesla Model S in February’s US market sales – 1,198 for the Leaf versus 1,150 for Model S. Coming in at third was the BMW i3 with 1,089 units sold. The Chevrolet Volt continues to follow farther behind the Leaf and Model S with 693 units sold. Consumers might be looking forward to the all-new 2016 Volt coming out later this year. Overall US plug-in sales were down 80 units from January and February 2014. Oregon testing road-usage program. Oregon and several other states are worried about losing tax revenue due to more plug-in electric and fuel-efficient vehicles entering their roads. So, Oregon is starting a test program staring July 1 where 50,000 registered vehicle owners will participate. Participating drivers will still pay the gas tax at the pump, but at the end of each month, mileage and fuel-consumption data from on-board diagnostics will be used to compare gas tax with a 1.5 cent-per-mile tax that would be charged under a road-usage charge. More than 10 states are in the process of drafting legislation for similar programs or test projects. Volkswagen AG is working hard at becoming the top vehicle seller in the world and the industry’s technology leader, CEO Martin Winkertorn said during a Geneva Motor Show news conference. The automaker is debuting the Sport Coupe Concept GTE at the show as an example of technology innovation. The sports coupe has a plug-in hybrid drive system that pairs a 3.0-liter V-6 with two electric motors. In the European test cycle, the car gets a 118 mpg fuel economy rating. California approves DME as a vehicle fuel. California’s Division of Measurement Standard’s issued a formal approval to Oberon Fuels for its dimethyl ether (DME) as a vehicle fuel, which will help with the fuel’s commercialization. “The State of California’s approval builds upon the growing body of certifications that demonstrate DME is a low carbon fuel that meets both industry standards for performance and environmental standards for compliance,” Oberon Fuels president Rebecca Boudreaux said. Kia pleased with Soul EV sales. Stronger-than-expected customer interest has inspired Kia to accelerate its roll-out plan. It’s the first electric car Kia has sold outside of Korea, and wants to make sure its suppliers, distributors, and dealers are ready in the US. The Soul EV first went on sale in October in California, with plans to expand to Oregon and a few East Coast markets later. The company hopes to announce a plan in April that will include wider availability than had been originally planned. Audi reveals plug-in offerings: Audi, which previously had only offered a plug-in hybrid option for its A3 compact car, now has two more plug-ins coming up. Audi will offer its Q7 sport-utility vehicle with two plug-in hybrid powertrains: a diesel option for Europe and a gasoline version for the U.S. and China. Audi has also announced that it will offer a battery electric version of its newly redesigned sports car, the R8 e-tron. The sports car will be able to travel about 280 miles on a single charge. More clean fleet vehicles: Four vehicle roll-outs sound good for fleets interested in bringing in more alt-fuel vehicles. Motiv Power Systems is launching a battery electric drive compatible with the Ford F59 chassis and has received an initial order for six vehicles for AmeriPride in Fresno, Calif. BioCNG will be upgrading a landfill gas-based compressed natural gas fueling station for the St. Landry Parish Solid Disposal District in Louisiana; and will be adding a second facility at the District’s recycling center in Opelousas. Coca-Cola has converted 39 GM Express vans to hybrid electrics using XL3 systems from XL Hybrids. It’s tied into an executive order last year by the California Air Resources Board and brings Coke’s total number of XL Hybrid-fitted vans up to 211. Efficient Drivetrains, Inc. (EDI) has announced the availability of a Class 3 utility plug-in hybrid truck. EDI says that it features an extended range of 300 miles and 50-to-120 kW of grid reliable export power. Two 350Green executives face fraud charges. Mariana Gerzanych and Timothy Mason – the two former top ranking executives of electric vehicle charging station supplier 350Green – have been accused in a federal court of falsely obtaining almost $3 million in grant money for a project, The Chicago Tribune reported. 350Green had been working with the city of Chicago to install its charging network. Gerzanych and Mason have been charged with obtaining funds by falsely claiming they’d paid subcontractors and vendors for work on the charging stations. Tesla cutting jobs in China. 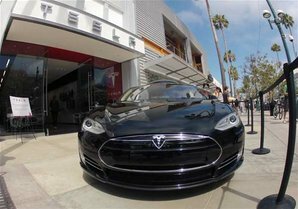 Tesla Motors Inc. may be reducing its staff by 30% in China as it makes structural changes in the market. The Chinese newspaper Economic Observer reported Tesla will eliminate 180 of the 600 positions in China because sales haven’t met expectations. What do Peter Ward, Rick Sikes, and Keith Leech have in common with Travis McGee? Taking their retirement ‘in installments’? 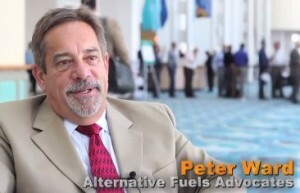 I asked that question of Peter Ward, Principal at Alternative Fuel Advocates, at an ACT Expo conference about why he’d left his position at the California Energy Commission but had continued in the clean transportation space. “I was infected with the alternative fuel passion many, many years ago,” Ward said in this Automotive Digest video interview. That started during the OPEC oil embargos in the 1970s – the “petroleum shocks.” Don’t be surprised to see Ward at future ACT Expo and other industry events, and to hear about projects he’s working on in the Sacramento area. Rick Sikes, Fleet Superintendent for the City of Santa Monica, and Keith Leech, Fleet Manager for the City of Sacramento, announced their retirements in January. They’ve been well known at NAFA Fleet Management Association and for making significant contributions to clean transportation. Sikes has played a leading role organizing AltCar Expo in Santa Monica since its inception in 2005. 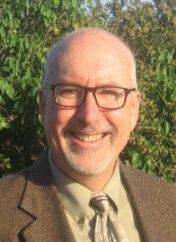 Leech served as President of the Sacramento Regional Clean Cities Coalition. I saw Sikes at the Long Beach Clean Cities meeting last month, where he confirmed that he’ll be staying active in the community. I also get the impression Leech will do the same in Sacramento. One of my colleagues will be retiring from an electric utility this spring, and will be starting up as a consultant supporting growth in electric vehicle (EV) charging. Multi-family dwellings, such as apartments and condos, is where he’s most concerned that EV charging faces its biggest obstacles and opportunities; that’s where he’ll bring his skillset and peer network to make a difference. When I’ve talked to colleagues, friends, and family members about their retirement plans, I’m usually told about the next phase of their working lives. That could be as a consultant working on projects in between travels; or a contract worker for their previous employer contributing their expertise; or a substitute school teacher; or a writer finishing that book they’ve put off all these years; or a student finishing up that degree or certification to go in a career direction they’ve always wanted to pursue. There’s also the option of continuing to work in their business, never really retiring. “Realize that you will be missed at the office for no more than a week and they will blame everything on you for at least a year after you are gone. Now that the tail end of the baby boomer generation has turned 50 as of last year, researchers have been tracking how this generation has been reinventing their careers in phase two – or phase three. AARP (formerly the American Association of Retired Persons) fills its monthly magazine with celebrity profiles where Jeff Bridges, Meryl Streep, and Bob Dylan continue loving their work and taking on projects. Clint Eastwood, 84, didn’t win an Oscar for “American Sniper,” but we do expect him to make another movie – he loves doing it. AARP tracks demographic research and finds that the fastest-growing segment in the workforce will be 65-to-74 year olds; with some Americans working well into their 90s. I started my practice, LeSage Consulting, last year in January at age 50. I was waffling over it when my significant other, who at age 51 had started a two-year master’s degree program in project management, gave me a reminder. I had committed to keeping my word, she said. (“Actions speak louder than words,” as my father used to say). So I took that plunge and haven’t regretted it. I won’t be getting any younger. Nobel Prize winning chemist (and champion of vitamin C as a healing agent) Linus Pauling offers a telling story – right up there with Travis McGee. In 1973 he co-founded a California research institute devoted to the study of the health effects of vitamin C and other nutrients. He conducted research there until his death from cancer in 1994, at age 93. I’ve always had a hunch I’ll end up traveling down a similar path as Linus Pauling, Chuck Parker, and Travis McGee. Editor’s note: Changes to LeSage Consulting website and Green Auto Market will be announced within the next couple of weeks. California’s cap-and-trade program, which began quarterly auction sales in late 2012, hit a benchmark last month. Companies invested $1.02 billion in carbon emissions credits, the largest auction event since it all started. 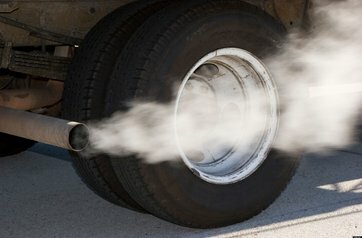 Analysts think that had to do with the state significantly increasing the pool of credits available for sale to meet the 2015 addition of motor vehicle tailpipe emissions into the cap-and-trade program. The cap-and-trade auctions have become a central aspect of the state’s AB 32 climate change law enacted in 2006. Under the state’s regulatory structure, large polluters buy carbon credits that come from businesses generating surplus allowances. Collected funds from the auctions go toward other emission-reducing endeavors, including sustainable energy projects and rebates for electric vehicles and solar panels. While China and the US are working on an agreement to mutually reduce their greenhouse gas emissions, their governments and those of states across the country and other nations around the world, are tracking how well California’s program may reduce carbon emissions. In its earliest phase, the state’s cap-and-trade system affected other industries beyond oil companies. The state doesn’t disclose which companies made allowance transactions during the quarterly auctions, but its list of qualified bidders includes Chevron USA, BP Energy Co., and Exxon Mobil Corp. Oil companies, refineries, and retail gas station owners, have warned that adding transportation fuel to the state program will be increasing the price at least 10 cents a gallon. Low gas prices have taken some of the weight out of that argument, but California officials have taken the warning seriously. The California Air Resources Board, which oversees the auctions, dramatically increased the volume of available credits. Credit prices did stay steady with that volume increase – participants paid $12.21 per credit for the right to emit carbon this year, which was similar to prices paid at previous auctions. Environmentalists, such as a representative from the Environmental Defense Fund, think the market is functioning properly. Oil companies are not as pleased with the regulatory structure that comes from AB 32. In addition the cap and trade, the state has enacted the Low Carbon Fuel Standard (LCFS) that calls for a reduction of at least 10% in the carbon intensity of California’s transportation fuels by 2020. Last month, the California Air Resources Board held a hearing on whether the regulation is working out. A decision is expected to be released this spring or summer. Environmentalists and alternative fuel producers argued that the state should stay its course; oil industry representatives disagreed. Nick Economides, manager of state fuels regulation at Chevron Corp., said the state’s mandate relies heavily on the development of alternative fuels, many of which haven’t yet panned out. He joined up with other oil industry executives who argued that the LCFS needs to be adjusted. “We have invested heavily (in alternative fuels) and regretfully, we have not been successful,” Economides said. Others make the argument that oil companies are not taking alternative fuels seriously at all – investments in biofuels, hydrogen, and other alternative energies are being done to “look good” with regulators and the general public, but are only being addressed at superficial levels. Similar arguments are made by electric vehicle advocates who talk about investments made in the past 30 years by major automakers for electric drive and other clean technologies – only to see these projects gathering mothballs. The US Dept. of Energy’s Clean Cities has issued several research resources for stakeholders in the past week. The Clean Cities 2015 Vehicle Buyer’s Guide offers vehicle selection, pricing, infrastructure, and emissions information on a wide selection of alternative fuel vehicles. Categories include propane, compressed natural gas, biodiesel, plug-in electric, plug-in hybrid electric, hybrid electric, and ethanol flex-fuel. Clean Cities also said that it’s moving forward on its request for information (RFI) project announced in November on purchasing and procurement for bulk vehicle orders. The RFI is soliciting feedback from industry, academia, research laboratories, government agencies, and other stakeholders on issues related to purchasing/procurement processes designed to coordinate and consolidate bulk alternative fuel vehicle, advanced vehicle orders, and vehicle subsystems. Responses are due no later than 5:00 pm eastern time on March 13, 2015. This announcement was coordinated with a public meeting for Clean Cities stakeholders to collect input in a new Clean Cities five-year strategic plan. Clean Cities encourages stakeholders to continue to give written comments through its Strategic Planning Meeting website until March 13. The Tesla Model S and Toyota Prius take best of awards from Consumer Reports. For the second year in a row, the Model S has taken the “best overall” category for its “innovation, magnificence, and sheer technological arrogance.” The testing team likes the fact that Tesla’s over-the-air software updates keep the 2013 model up to date with many of the same features as the new models. The Toyota Prius took the “green car” category again, which has been the case consecutively since 2004. Testers haven’t been that impressed with ride comfort, cornering, and interior, but the affordability, fuel economy, packaging and “blue-chip reliability” make it the “perfect economical transportation solution.” Rating indicators for all Consumer Reports categories are based on overall road-test performance, reliability, and safety. AltCar has announced dates for its two 2015 events. For the Northern California event, the City of Oakland AltCar Conference & Expo will be held May 28. The 10th anniversary of the City of Santa Monica’s AltCar Expo will take place on Sept. 18-19. For participation, you can contact Platia Productions at (310) 390-2930, ext. 3. Toyota started production of Mirai fuel cell sedan at its Motomachi Plant in Toyota City, Japan. The fuel cell car can travel 400 miles on a fueling and has been very important in Toyota’s green vehicle strategy; however, the production numbers are limited to 700 units this year, 2,000 in 2016, and 3,000 in 2017. Daimler joins other automakers selling in the European market by implementing more material cost efficiencies to meet stringent European Union emissions targets. Daimler Chief Financial Officer Bodo Uebber says that in 2014, the automaker offset the burdens from the variable cost for its carbon reducing measures with material cost efficiencies such as sharing more commonality among its different car lines. Uebber expects to do the same this year through at least 2017. The Propane Education & Research Council (PERC) is funding $600,000 to Icom North America to support development of its propane autogas technology in the Ford 3.5L EcoBoost engine. That should assist Icom receiving both US Environmental Protection Agency and California Air Resources Board certifications for the 3.5L EcoBoost platform. Icom’s JTGhp direct-injection system can be applied to the Ford F-150, Explorer, and Taurus vehicle platforms. PERC also announced last week that it will be displaying at the NTEA Work Truck Show in Indianapolis. Fleet managers are invited to interact with PERC’s dimensional displays for calculating lifetime operating costs, and seeing cost savings that comes from using propane autogas. Volvo Cars is joining the autonomous vehicle test driving movement by placing 100 self-driving cars on Gothenburg, Sweden streets by 2017. Local residents will be using these autonomous Volvo XC90 crossover test vehicles commuting to work on a controlled 31-mile route. That test is expected to run through the spring of 2019 and will use sensors, cloud-based positioning systems, intelligent braking, and steering technologies through a new Volvo autopilot system. Texas state grants had pretty good return on investment with grants issued to natural gas vehicles (NGVs), according to a study by the University of Texas San Antonio’s Institute for Economic Development. Three state grants, totaling $52.9 million, supported construction of new natural gas fueling stations and the adoption of NGVs. That generated $128 million in economic impact, $52.9 million in gross state product, and supported 927 full-time jobs in 2014. The Texas Commission on Environmental Quality administered the three grants that went out to the Clean Transportation Triangle, the Alternative Fueling Facilities Program, and the Texas Natural Gas Vehicle Program. As biofuel supporters wait for the US Environmental Protection Agency to get around to announcing its 2014 volume standards, another action was taken in Washington. A bill introduced last week by Senators Pat Toomey (R-Pa.) and Dianne Feinstein (D-Calif.) would repeal the corn ethanol mandate in the Renewable Fuel Standard (RFS). Feinstein is especially concerned about corn prices increasing if that mandate continues. They’re misunderstanding the facts, according to Bob Dinneen, president of the Renewable Fuels Association. “Corn is less expensive today than when the RFS was passed,” Dinneen said. Solar power will see substantial growth in 2015, according to a new study by GTM Research. Solar installations will grow in 75% of US states, with incremental growth in Arizona and Massachusetts but significant growth in Georgia and Utah.